Now that autumn has chilled the air, my thoughts turn to beverages that warm the body and soul. 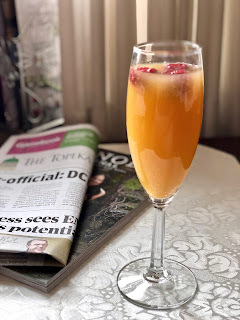 Besides a morning cup of coffee (or two...maybe three) and afternoon tea, I wanted a grown-up drink to sip in the evening while watching seasonal movies or reading a cozy book. My first thought was hot apple cider with a little added brandy or cinnamon schnapps, but that didn't strike my taste fancy. Then I considered hot chocolate with the addition of a coffee or Irish liqueur, but it didn't seem cold enough for such a rich drink. My version starts with a bottle of Missouri’s Baltimore Bend Vineyard’s C2, but any good dry red wine will do. The addition of apple cider and brown sugar provides sweetness, balanced by fresh orange juice and zest. Cinnamon sticks, whole cloves, and half of a nutmeg add spice, and a final splash of brandy gives warmth beyond the stove’s heat. Mulled wine not only warms up a late autumn evening, it will also be lovely served as an after-Thanksgiving-dinner drink. Plus, I can vision keeping a pot on the stove for a holiday party, Christmas Eve celebration, a wind-down drink on Christmas evening, or a warm beverage to see in the New Year. Combine all of the ingredients except the brandy in a large pot. Bring to a boil, stirring to dissolve the sugar, and then lower the heat and simmer for 10 minutes. Add the brandy. Serve in mugs with a cinnamon stick and an orange peel. I don't know how you do it:) I can't even begin to think about the holiday season ahead and you are already planning seasonal movie watching and beverages! Kudos to you and that spirit of yours!! !